CLEVELAND (AP) The Cavaliers’ lineups are changing daily. Their defense is a mess, their slow starts are puzzling and the starting point guard is hurt. Although he often handles the ball and runs Cleveland’s offense, James had not officially been listed as a guard since 2012 with Miami. The superstar added 13 assists, including a no-look, behind-the-back dish to Jae Crowder for a 3-pointer during Cleveland’s 15-3 spurt in the third quarter. ”You’re playing against the best player on the planet,” Chicago coach Fred Hoiberg said. It was vintage James, perhaps the only player in the game who can play either guard spot, both forward positons and center. ”Ever since I was a kid I’ve always learned every position on the floor,” he said. ”The point guard, shooting guard, small forward, power forward and center. And know all the plays, what they’re doing and reads. Coach slides me to the 1, I know every set. If he slides me to the 5, I know the 5. I know the 4. I know the 3. I know the 2. The Cavs were coming off an embarrassing loss to Orlando and their defense was atrocious in the first half, when the Bulls made 12 3-pointers and scored 65 points – 12 less than in their previous game. Lue has been experimenting with lineups and combinations because of new players and injuries. He trotted out another new starting five – his third in three games – against the Bulls, moving James to the point, and starting Tristan Thompson at center so Love wouldn’t have to guard 7-foot-1 Robin Lopez the entire game. But Cleveland’s starters let Chicago control things early. Dropping uncontested 3-pointers, the Bulls opened a 14-point lead before the second group – led by Wade and Jeff Green – got the Cavs back in it. Green finished with 16 points. Cavaliers: Snapped a five-game losing streak to Chicago. … Starting PG Derrick Rose missed his second straight game with a sprained left ankle. 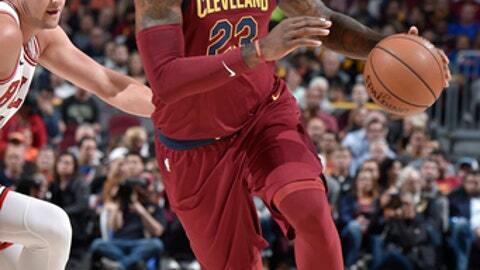 … James played in his 771st regular-season game, matching center Zydrunas Ilgauskas for the most in franchise history.